The aim of the research was to establish the motor efficiency of boys between the ages of 7 and 10 years, attending Grades 1-4 of music oriented and general education classes. The research material included 106 boys aged 7-10 of the Primary School Complex No. 2 in Szczecin. There were 50 children examined in the music oriented classes, and 56 in control group. The research was conducted twice in the school year 2006/2007, including the same research material – first in September 2006, second in June 2007 accordingly. To evaluate the level of motor skills the EUROFIT European Fitness Test was used. Test results were statistically analyzed. The Utenberger’s test resulted in statistically significant better results of boys from the Grade 1 of control group (C) compared to their peers from Grade 1 of music oriented classes. In research II, only boys of Grades 1-2 M had statistically significant results improvement in the Utenberger’s test in comparison with research I. In research II, male students of Grades 1, 2, 3 M acquired statistically significant better results in the speed test of the upper limb than their peers of Grades 1 C, 2 C, 4 C. Moreover, in study II the subjected individuals of Grades 1 M, 2 M, 4 M and 4 C obtained statistically significant increase in their results in comparison with study I.Trunk flexibility of male students from music-oriented classes and control group was in line; the same was true for the jump test. In study II, trunk flexibility and endurance in jumping insignificantly improved in all examined classes. &#xD; In the study, boys from Grade 4 M, obtained statistically more significant average hand strength results compared to their peers from Grade 4 C. In study II, boys from Grades 1 and 2 M obtained statistically significantly lower average values in this test in comparison with boys from Grades 1 and 2 C. In study II, unlike in study 1, there was a statistically significant improvement in the test results only in boys from Grades 3 and 4 M. In contrary, there was a statistically significant improvement of hand strength results in all grades of control groups compared to study I. &#xD; In trunk flexibility test, boys from Grade 1 M had statistically lower mean values than boys from Grade 1 C. In the same study, boys from grades 3 and 4 M had statistically significantly higher average values than their peers from Grades 3 and 4 C. In study II, statistically significant differences were found between Grades 3 M and 3 P as well as between 4 M and 4 P. In study II, in Grades 1 C and 2 M, there was a statistically significant results improvement compared to study I. Functional capacity of boys from all subjected classes was similar in both studies. In study II, statistically significant improvement in this test was found only in Grade 2 M. In agility fitness test, in study II, boys from Grade 4 M had statistically significantly better results opposed to Grade 4 C. It turned out that boys from grades 1 M, 2 M, and 3 C, had statistically significant results improvement in study II compared to study I. Based on the conducted studies, the following conclusions have been formulated: 1. Motor efficiency of boys from music-oriented as well as control classes was comparable. 2. Practicing musical instruments at the early education stage did not have any significant influence on the general motor efficiency of male pupils. 3. As part of preventive measures of degenerative overload changes of the motor system in music-oriented classes, the national curriculum program of study for PE should be modified and supplemented with exercises strengthening trunk muscles and increasing the range of motion in the shoulder and pelvic girdles. 1. Armstrong G., Miranda E., Lambert E., Lambert V., Michael I. Physical fitness of South African Primary School Children 6 to 13 years of age: Discovery Vitality Health of the Nation Study. Perceptual &amp; Motor Skills. 2011; Vol. 113(3): 999-1018. 2. Baadjou V.A., van Ejisden- Besseling M.D., Samama-Polak A.L., Smeets R.J., Passos V.L., Westerterp K.R. Energy expenditure in brass and woodwind instrumentalists: the effect of body posture. Med Probl Perform Art. 2011; 26 (4): 218–223. 3. Bittner-Czapińska E., Janiszewski M. Analiza wybranych parametrów czynnościowego zespołu wykonawczego u akordeonistów. Medycyna Pracy. 2004; 55 (4): 337–339. 4. Bouchard C., Shephard R.J. Physical activity, fitness, and health: the model and key concepts, eds. C. Bouchard, R.J. Shephard, T. Stephens. Physical activity, fitness, and health. Champaing, III. Human Kinetics. 1994: 77-88. 5. Bubka Z. Ćwiczenia muzyczno-ruchowe formą aktywizacji ruchowej dziewcząt, eds. R. Bartoszewisz, E. Bolach, J., A. Nowak. Rozprawy naukowe AWF we Wrocławiu. AWF, Wrocław 2009; 28, 364-366. 7. Burkholder K.R., Brandfonbrener A.G. Performance-related injuries among student musicians at a specialty clinic. Medical Problems of Performing Artists. 2004; 19 (3): 116–122. 8. Cepero M., Lopez R., Suarez-LLorca C., Andreu-Cabrera E., Rojas FJ. Fitness test profiles in children aged 8-12 years old in Granada (Spain). 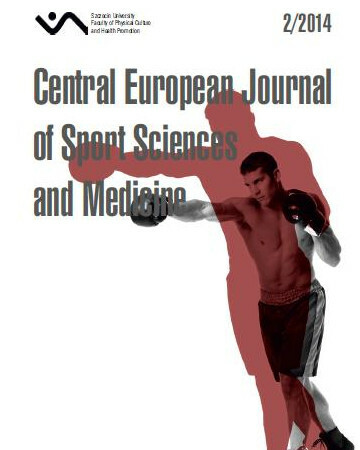 Journal of Human Sport&amp;Exercise. 2011; 6(1): 135 -145. 9. Chamagne P. Functional dystonia in musicians: rehabilitation. Hand Clin. 2003; 19 (2): 309–316. 10. Chwała W. Badania nad strukturą „energetycznych” zdolności motorycznych i trafnością ich testowania. Rozprawa doktorska, AWF. Kraków 1997. 11. Demczuk-Włodarczyk E., Marciniak J., Bieć E. Symetria tułowia u wiolonczelistów. Fizjoterapia. 2002; 10 (3–4): 28–31. 12. Drozda K., Lewandowski J. Epidemiologia bólów kręgosłupa wśród młodzieży szkół średnich Poznania. Fizjoterapia Polska. 2001; 1 (4); 11: 31–40. 13. Drozda K., Lewandowski J., Górski P. Bóle kręgosłupa u młodzieży szkół gimnazjalnych i ponadgimnazjalnych zamieszkałej w środowisku miejskim w Polsce, na przykładzie Poznania. Ortopedia, Traumatologia, Rehabilitacja. 2011; 13 (5): 489–503. 14. Dupuis M. Les pathologies de l`appareil locomoteur chez le musicien. L`union Medicale Du Canada. 1993; 122 (6): 432–436. 15. Ekblom Ö., Oddsson K., Ekblom B. Physical performance and body mass index in Swedish children and adolescents. Scandinavian Journal of Nutrition. 2005; 49 (4): 172 – 179. 16. Fidyk S. Percussion. Teaching Music. Feb 2009; Vol. 16 (5): 50–52. 17. Foxman I., Burgel B.J. Musician health and safety: Preventing playing-related musculoskeletal disorders. American Association of Occupational Health Nurses Journal. 2006; 54, 7: 309–316. 18. Gedl-Pieprzyca I. Pływanie formą rekreacji i korektywy dla dzieci uczęszczających do szkół muzycznych. In: Sport pływacki i lekkoatletyczny w szkole, eds. J. Migasiewicz, K. Zatoń. Konferencja Naukowa, Wrocław-Srebrna Góra. AWF. Wrocław 2001; 165–169. 19. Grabowski H., Szopa J. Eurofit. Europejski Test Sprawności Fizycznej (przekład z języka angielskiego). AWF. Kraków 1991. 20. Gregosiewicz A., Okoński M., Gil L. Specyfika uszkodzeń narządów ruchu u dzieci uczących się gry na instrumentach smyczkowych. Chirurgia Narządu Ruchu. 1990; 55 (3): 191–194. 21. Grivas T.B., Vasiliadis E.S., Maziotou Ch., Savvidou O.D. The direct cost of "Thriasio" school screening program. Scoliosis. 2007; 2: 7. 22. Janiszewski M., Kluszczyńska A., Błaszczyk A., Pieszyński I. Wpływ wykonawstwa muzycznego na występowanie wybranych zaburzeń statyki ciała u dzieci ze szkoły muzycznej. Fizjoterapia Polska. 2002; 2, 1: 46–58. 23. Jankowicz-Szymańska A., Pałucka M., Mikołajczyk E. Jakość postawy ciała uczniów I i VI klasy podstawowej szkoły muzycznej. Fizjoterapia. 2009; 17, 1: 20–29. 24. Jopkiewicz A., Suliga E. Biomedyczne podstawy rozwoju i wychowania. Instytut Technologii Eksploatacji. Radom-Kielce 2011. 25. Jürimäe T; Volbekiene V; Jürimäe J; Tomkinson GR. Changes in Eurofit test performance of Estonian and Lithuanian children and adolescents (1992-2002). Med Sport Sci. 2007; Vol. 50: 129-142. 26. Kaneko Y., Lianza S., Dawson WJ. Pain as an incapacitating factor in symphony orchestra musicians in São Paulo, Brazil. Medical Problems of Performing Artists. 2005; 20(4): 168-174. 27. Kava K., Larson C., Stiller CH., Maher S. Trunk endurance exercise and the effect on instrumental performance: a preliminary study comparing Pilates exercise and a trunk and proximal upper extremity endurance exercise program. Music Performance Research. 28. Kluszczyńska A. Wpływ wykonawstwa muzycznego na występowanie zniekształceń statycznych ciała u dzieci ze szkół muzycznych. Rozprawa doktorska. AM. Łódź 2003. 29. Knuessel O., Jelk W. Sitzbaelle und ergonomisches Mobiliar im Schulzimmer. Resultate einer prospektiven kontrollierten Langzeitstudie. Schweizerische Rundschau fuer Medizin Praxis. 1994; 83 (14): 407–13. 31. Liu S., Hayden G.F. Maladies in musicians. South Med J. 2002; Jul 95 (7): 727–734. 32. Mleczko E. Przebieg i uwarunkowania rozwoju funkcjonalnego dzieci krakowskich między 7 a 14 rokiem życia. Wyd. Monograficzne Nr 44, AWF. Kraków 1991. 33. Nowotny J., Nowotny-Czupryna O., Brzęk A., Kowalczyk A., Czupryna K. Postawa ciała a zespoły bólowe kręgosłupa. Ortopedia, Traumatologia, Rehabilitacja. 2011; 13 (1): 59–71. 34. Ohtsuka Y, Yamagata M., Arai S., Kitahara H., Minami S. School screening for scoliosis by the Chiba University Medical School screening program. Results of 1.24 million students over an 8-year period. Spine. Nov 1988; Vol. 13 (11): 1251-1257. 35. Orlicz B. (1996). Społeczne uwarunkowania sprawności fizycznej dziewcząt polskich. Wychowanie Fizyczne i Sport. 1996; t. XL, 2, 3-10. 36. Osiński W. Wielokierunkowe związki zdolności motorycznych i parametrów morfologicznych. Badania dzieci i młodzieży wielkomiejskiej z uwzględnieniem poziomu stratyfikacji społecznej. Wyd. Monograficzne. AWF. Poznań 1988: 261. 37. Osiński W. Antropomotoryka. AWF. Poznań 2003. 38. Permoda A., Chudak B., Permoda A. Programy profilaktyczne jako jedyna szansa na opanowanie „epidemii wad postawy”. Medycyna Manualna. 2011; t. 15, 2: 3-7. 39. Perotta F., Corona F., Cozzarelli C. The efficacy of the project motorfit: Educational Actions through physical activity in schools. Sport Science. 2011; 4(1): 34-39. 40. Przewęda R. Uwarunkowania poziomu sprawności fizycznej polskiej młodzieży szkolnej. AWF. Warszawa 1985. 41. Raczek J. Antropomotoryka. Teoria motoryczności człowieka w zarysie. PZWL. Warszawa 2010. 42. Stanisz A. Przystępny kurs statystyki z wykorzystaniem programu STATISTICA PL na przykładach z medycyny. StatSoft. Kraków 2000. 43. Steinmetz A., Seidel W., Muche B. Impairment of postural stabilization systems with playing-related musculoskeletal disorders. J. Manipulative Physiol Ther. 2010; 33 (8); 603–611. 44. Storm S.A. Assessing the instrumentalist interface: modifications, ergonomics and maintenance of play. Physical Medicine and Rehabilitation Clinics of North America. 2006; 7 (4): 893–903. 45. Stupnicki R., Przewęda R., Milde K. Centylowe siatki sprawności fizycznej polskiej młodzieży wg testów EUROFIT. AWF. Warszawa 2003. 46. Szopa J., Chwała W., Rychlewicz T. Badania struktury zdolności motorycznych o podłożu energetycznym i trafność ich testowania. Antropomotoryka. 1998; 17: 3-41. 47. Szopa J., Mleczko E., Żak S. Podstawy Antropomotoryki. PWN. Warszawa – Kraków 1996. 48. Ślężyński J., Róg J., Dębska H. Budowa i postawa ciała uczennic ze szkoły baletowej, muzycznej i ogólnokształcącej. Wychowanie Fizyczne i Sport. 1978; 1: 37- 44. 49. Umiastowska D., Makris M., Pławińska L. Dziecko szczecińskie. Wydawnictwo Naukowe Uniwersytetu Szczecińskiego. Szczecin 2001. 50. Volbekiene V.G. Health-related physical fitness among schoolchildren in Lithuania: A comparison from 1992 to 2002. 2007; 35(3): 235-242. 51. Wilke C, Priebus J., Biallas J., Froboese I. Motor activity as way of preventing musculoskeletal problems in string musicians. Medical Problems of Performing Artists. 2011; 26 (1): 24–29. 52. Yawn B.P., Yan R.A., Hodpe D., Kurland M., Shaughescy W.I., Ilstrup D., Jacobsen S.L. A population – based study of school scoliosis screening. I. Am. Med. Assoc. 1999; 282, 15: 1427–1432.